NETWORK UPDATE: The Oregon vs. Michigan State COLLEGE FOOTBALL game adjusted to 2.5. The reruns of RUNNING WILD and BULLSEYE each lost 0.1 in final numbers. CABLE HIGHLIGHTS: Sports (and ESPN) dominated Saturday cable, with COLLEGE FOOTBALL and various pre-and-post shows accounting for 7 of the day’s Top 10 slots. The Oklahoma vs. Tennessee game ranked highest at 1.35. There was still room for NASCAR, which had a 0.58 rating on NBC Sports Net, and the Women’s Final of the US Open was at 0.35 on ESPNF. The other major player was Adult Swim, which had its middle of the night animation line-up back in full force. (Some of the titles are on the chart while others aren’t, because the latter are quasi-originals that ran in the US with limited distribution and different edits.) They were led by DRAGON BALL Z at 0.66/1.34M, then AKAME GA KILL at 0.61, MICHIKO & HATCHINI at 0.53/1.02M, SWORD ART ONLINE at 0.46, NARUTO at 0.42/863K, ONE PIECE at 0.36/726K, and ATTACK ON TITAN at 0.31/613K. 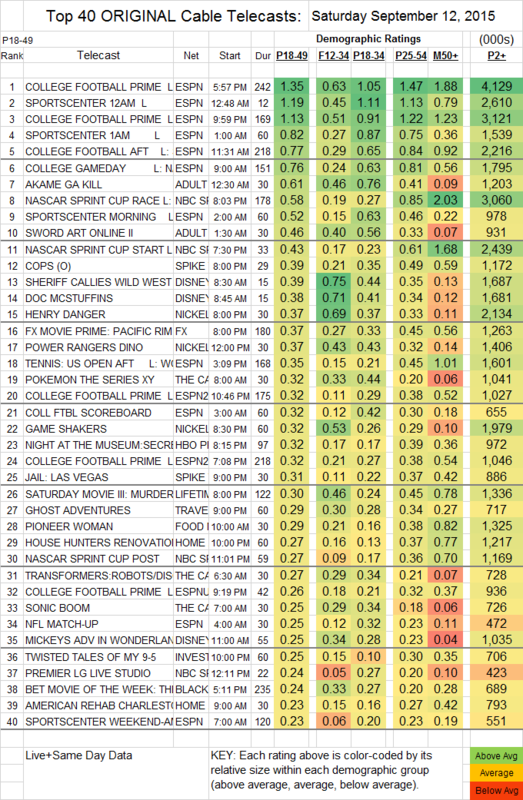 Elsewhere, an original COPS was at 0.39 on Spike, and Food Network’s PIONEER WOMAN was at 0.29. HBO’s FERRELL TAKES THE FIELD special was at 0.21. TBS’s AMERICA’S NEXT WEATHERMAN gained 0.02 to 0.20. CEDAR COVE (Hallmark) rose 0.03 to 0.14. Starz’s SURVIVOR’S REMORSE kept falling, down 0.03 to 0.14, and BLUNT TALK climbed 0.03 to 0.10. BIG BROTHER AFTER DARK (POP) was at 0.04/161K.